There are all sorts of rules about farming and ranch life. Leave the gate the way you found it. Never turn your back on a dairy bull. Pigs will bite the hand that feeds them. If you try to carry eggs in anything but an egg basket (which reminds me, I need to go get them out of the four-wheeler saddlebags) at least one will wind up cracked or broken. If rain is predicted and you water the garden, it won’t rain. If rain is not predicted and you wash the pickup, it will rain. The setting hen will always take over the box where everyone else wants to lay eggs, resulting in squabbles and broken eggs (lots of ranch rules about broken eggs…). 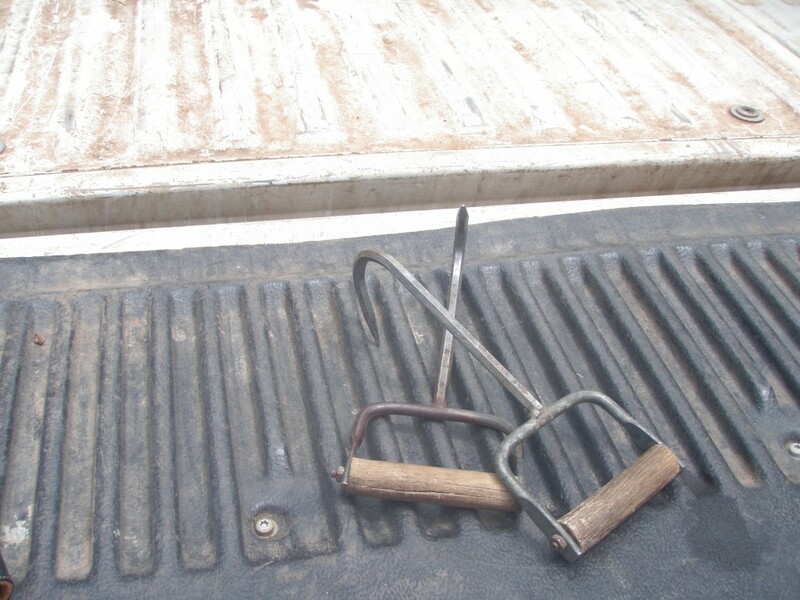 And one of the most important: always make sure you’ve found all the hay hooks when you’re done hauling the hay. Because that last one has a sort of Murphy’s Law corollary. 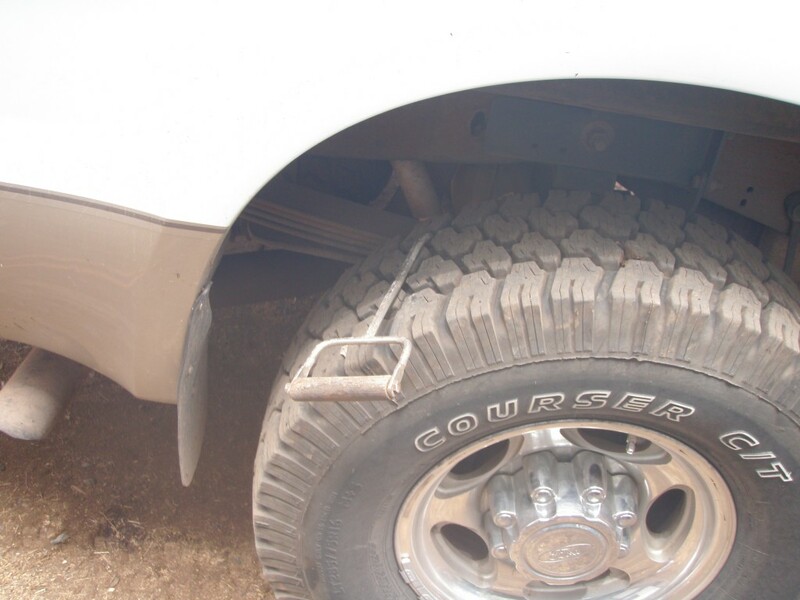 Unfound hay hooks will wind up in a tire. This entry was posted in Farms, Money Matters and tagged dairy bull, hay hooks, pigs, rain, rules. Bookmark the permalink. You probably know that rain and cut hay do not mix well. If you should be so unfortunate to have rain on your cut hay while it is curing, figure that half its value is lost – commercial value. As you know from buying hay yourself, dusty (moldy) hay does not bring much of a price. Sheep do not seem to be so fussy. If we end up with a few slightly dusty bales, we feed them to the sheep and they are as happy as ever. So, nutritional value is a different issue. Yes, there is dry matter loss and nutritional loss. How much just depends on the amount of rain, how dry the hay was before the rain, and how fast it dries off. My husband wants to try turkeys but we have have been warned about how stupid they are.Stories about drowning in the rain & that sort of thing.Maybe next year. Well, Inez, I would have to say that domestic turkeys are not the brightest bulbs in the bird family. The heritage breeds, such as the Narragansett, the Bourbon Red and the Bronze, are a step up from the commercial Broad-Breasted White. And wild turkeys are pretty wily. As long as you protect them from predators and make sure they have shelter, they should do OK. Home-raised turkeys (I understand Bourbon Reds seem to be the best of the heritage breeds for flavor) taste about a million times better than commercial birds. “If you bale freshly cut hay and put it in your barn, there’s a chance it’ll spontaneously combust (and you’ll lose both your hay and your barn).” Someone told me that. Having neither barn nor the need to grow, harvest, and bale hay, I didn’t give it much thought. But it got me wondering… 1. Is this true? How and why? 2. After cutting, is the hay left lying in the field to dry? If so, for how long? 3. What if it rains the day after the hay is cut? Wait a little longer for it to dry? 4. We owned a horse when I was a child. I recall one cardinal rule of hay bales (ready for the horse’s consumption) is that they were never to be allowed to get wet, lest they develop mold. But, I see big “rolls” of what I think is hay left out in the field in the rain. If it’s cut, allowed to dry, rolled up into those big rolls, and then allowed to get wet again, doesn’t that defeat the purpose? Thanks. Yes, hay must be dried before it can be baled and put in the barn. Many a barn has burned to the ground because the hay was put up wet. It starts to rot and creates considerable heat (just as a compost pile will heat up). Eventually it gets hot enough to catch something on fire. Many farmers these days run it through a machine called a tedder that breaks the stems down so it will dry faster. How long hay is left in the swath (the long rows after it is cut) depends on the weather. In my neck of the woods, that’s usually about 48 hours. If it does get rained on, you turn it again and let it dry some more before you bale. Horses are more sensitive to mold than cows, especially pregnant mares; moldy hay can cause them to abort. Those big hay rolls are probably going to cows, so it’s not as much of a problem. The outer layer may get wet, but once the rolls are broken open, the inside is still fine. Old-timers used to make hay stacks that shed rain quite well. The animals would pull the stacks apart to get to the dry stuff. Thanks for stopping by!